After you run an ultra-marathon, it’s apparently compulsory that you write a long and painfully detailed report agonizing over the minutiae of your race. I know this because I read countless race reports in preparation for the Kneeknacker which was to be my first ultra. Maybe all the running I’ve been doing has jiggled my brain into mush, but instead of finding these reports to be coma-inducing as might be expected, I actually found many of them to be strangely compelling. It seems that attempting to run a long ways lends itself to good narrative; there are guaranteed to be plenty of obstacles to be overcome and plenty of time in which to dwell on them. So before I forget the minutae (having a poor memory is the only way to do these sorts of things repeatedly), here’s the story of my first Kneeknacker. 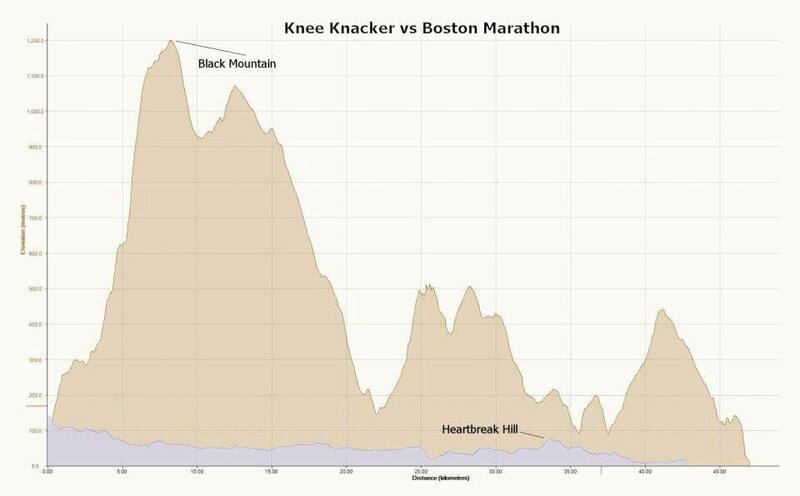 You’re not allowed to write a Kneeknacker race report without including this elevation profile. Less than a year ago, I started running consistently for the first time since 2005. I was initially motivated by the fact that it provided a way to challenge myself in the mountains without the risks and stresses of serious alpine climbing. As my interest in racing grew, I eventually came around to the idea of running ultras. My opinion that they were long, ache and pain-wracked shuffling ordeals didn’t change, but for some reason I began to think that the ordeal might be enjoyable. 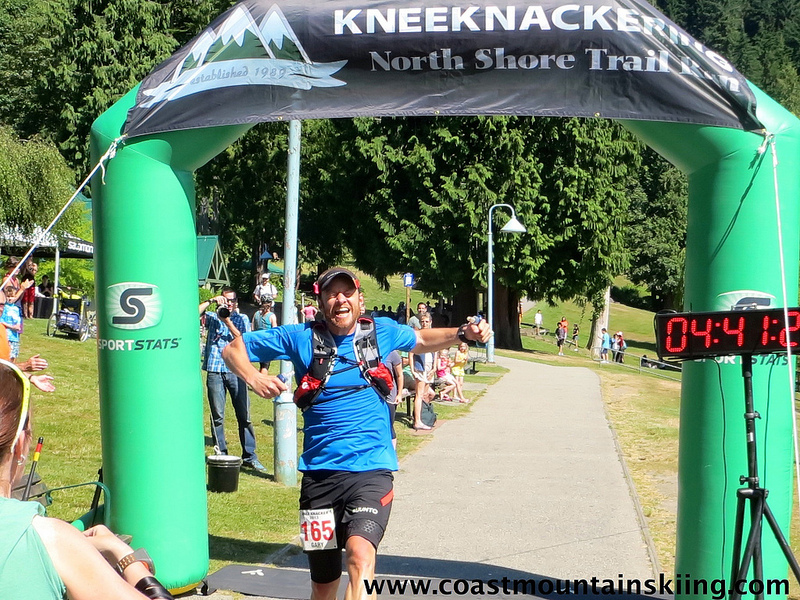 Thankfully, at 30 miles the Kneeknacker is about as short as ultras come and it’s actually not uncommon for me to do hard efforts in the mountains on skis or on foot of a similar duration. When I learned I’d been picked in the lottery, I wasn’t terrified, but I was well aware that it was twice the distance of any running race I’d ever done before. In the lead-up to the race, I was very fortunate to have great running partners in Brad and Eric, and also to have a chance to run with Adam and Gary who were very generous in sharing their hard-won knowledge and experience. I also spent/wasted quite a bit of time researching ultra-running (ie. surfing running sites on the internet), so I felt like I had a pretty good idea of what I was in for. However, no matter how much you know about something, there will always be something missing until you experience it (philosophically, this is actually a highly contentious proposition). In spite of the fact that we were apparently “born to run”, it’s incredibly difficult to run a lot without getting injured. In this regard, I think that the fact that I’m a bit less “type-A” than your average ultra runner might actually work to my advantage. If something hurts (generally it’s been my IT band, but sometimes also my heel) I’ll happily use it as an excuse to ease off a bit or just go climbing instead. 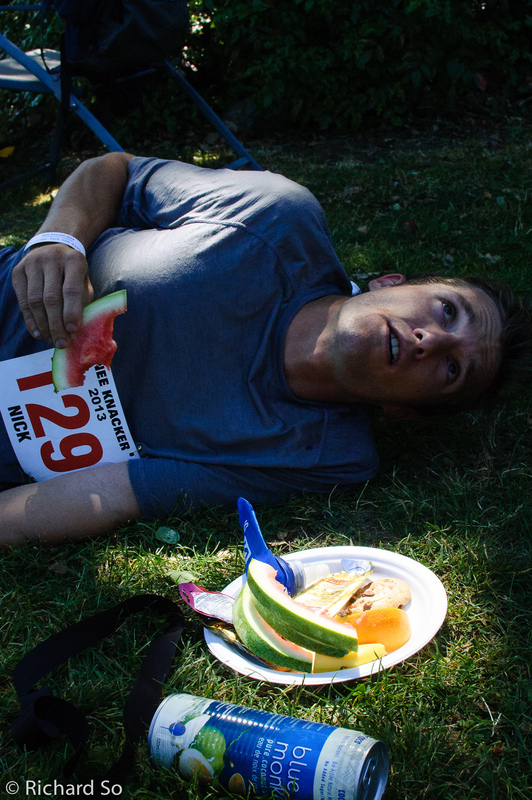 It’s a cliché, but getting to the start line healthy really does seem to be half the battle. I got to the start line thanks to my aunt Sue who was not only volunteering, but had agreed to help me out at some of the aid stations throughout the race. 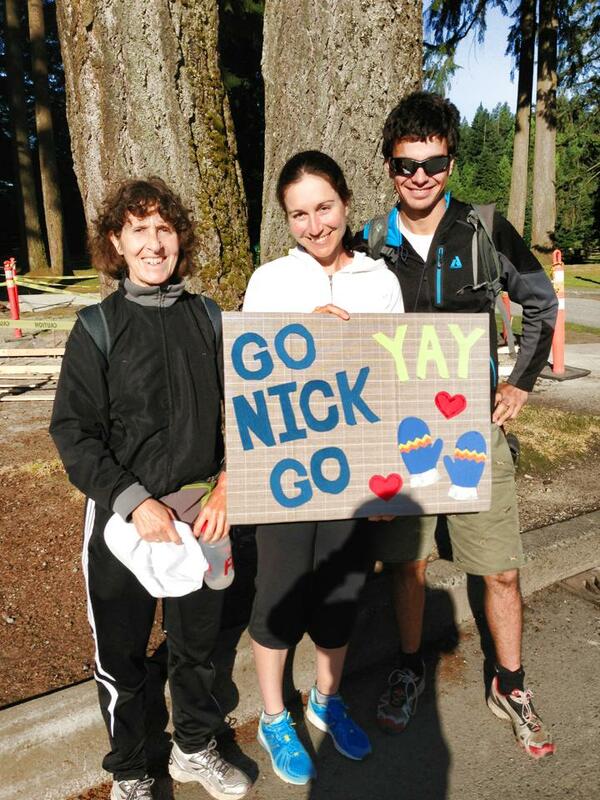 Karina and Eric also drove up from Squamish to cheer me on, so I had plenty of support out on the course. I rolled out of bed at the last possible minute which was unfortunately still 4am. I’ve noticed that Nutella is a dietary staple for many great ultra runners and it has been no great hardship for me to incorporate it into my pre-race breakfast. Once at the start, I ran around a bit, but didn’t really bother with much of a warm-up as I figured I’d have plenty of time to ease into things during the race. This turned out to be true. In fact the start was a bit anti-climactic; I’d been feeling nervous and had been mentally preparing myself for the suffering to come, but once “go” had been shouted, we took off at a very sensible jog and I could have almost mistaken it for just another group run. While strategizing prior to the race, I decided that I should start as conservatively as possible. Owing perhaps to having watched too many Steve Prefontaine movies at an impressionable age, this strategy always seems to be a difficult one for me to execute. On this day, however, I managed to hold myself back and tuck in behind Gary who I knew would pace things wisely. When I started to get back into running, uphills were my biggest weakness. In retrospect, I was just out of shape. Nonetheless, running and power-hiking uphill is something that I’ve consciously worked on since and I would now say that at the very least I’m more than just a downhill specialist. As a result, I felt great during the ascent of Black Mountain. In fact I had a peculiar experience: I enjoyed myself. I still don’t think that’s supposed to happen in races. 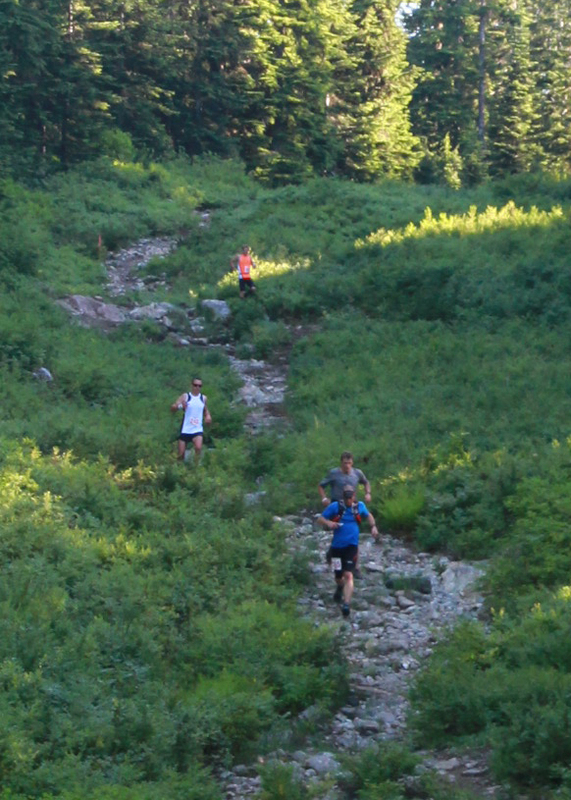 As the ascent steepened, Shaun Stephens-Whale took off ahead and Graeme Wilson hung back with Gary and myself. We hiked steadily, but I was still able to admire the views and chat a bit with Gary. We crested Eagle Bluffs and cruised towards the Black Mountain aid station on one of the nicest sections of the entire course. Once beyond the aid station, the trail switchbacks down towards Cypress and I got my first taste of how Gary would be running the downhills. In fact, after so much hiking it felt great to finally let my legs turn over more quickly and so I stayed right on Gary’s shoulder as we ran towards the first major aid station. 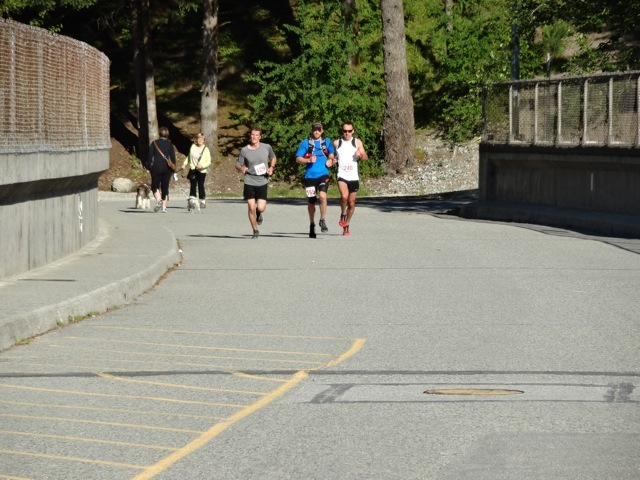 After spreading out a bit through the aid station, Gary, Graeme and I quickly bunched back together and eventually passed Shaun as we traversed across Hollyburn and began to make the long descent to the Cleveland Dam. I consider myself to be a pretty respectable downhill runner. I’ve got good balance (years of climbing? ), decent leg speed (remnants of high school track? ), good momentum (ice cream and beer diet?) and a cavalier attitude towards falling (under-developed frontal cortex?). I knew I could run downhill very quickly; unfortunately this is pretty much irrelevant in a race like the Kneeknacker. What actually matters is how fast you can run downhill without destroying your legs for the remainder of the race and this wasn’t something I was confidant about. 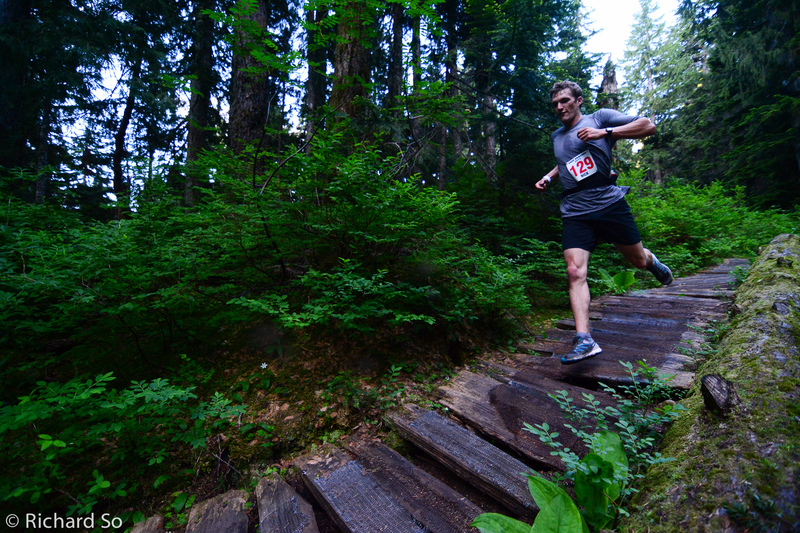 It’s also a difficult thing to judge because running downhill has a fairly minimal aerobic component so it’s easy to feel great while you unknowingly trash your legs. Knowing that Gary would push the descents, I was prepared to let him go if he did anything crazy. In the end, I judged that his pace was reasonable and along with Graeme, we careened towards the Dam with Gary occasionally shouting out warnings like “heads”, “sharp left” and “deer”. As we approached the half-way point of the race, Gary said something along the lines of “The race ends at the Dam, right?”. In retrospect this was wonderful piece of sandbagging, and as an experienced sandbagger myself I ought to have recognized it as such. 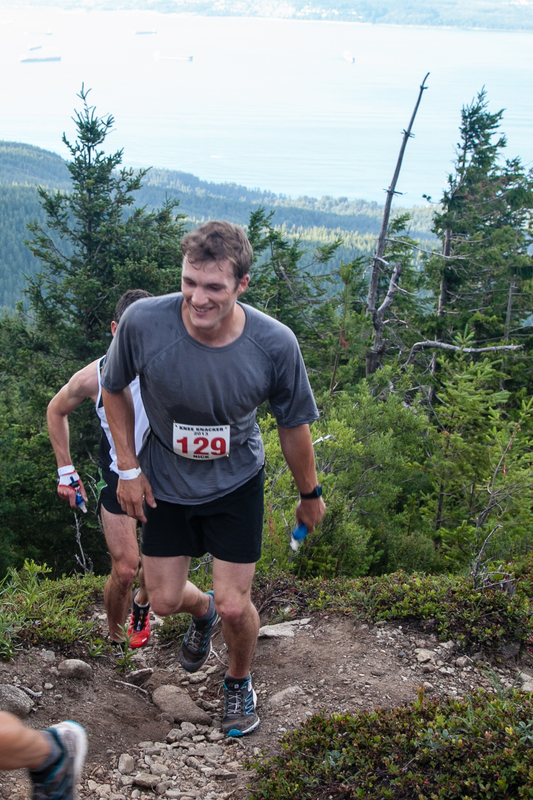 I was feeling great, however, and as I ran through the aid station I actually thought to myself that I was just getting warmed up and it was probably time that I started racing for real. As a result, I pushed the pace up Nancy Green Way and as I reentered the trail amidst the throngs of Grouse Grinders I had opened up a lead. I continued to climb well across the eroded flanks of Grouse, but it dawned on me that I had left behind the group run and was now properly in a race. It was exciting because I was in the lead and feeling strong. However, it also brought with it doubts and uncertainties about what lay ahead and what was going on behind me. As a result, I think that I tightened up imperceptibly and tried to force my way across the slopes of Grouse and Fromme when I should have been focused on staying relaxed and floating over the roots and rocks with as little effort as possible (it sounds so easy now!). As part of my onerous pre-race preparation I’d watched hours of Kilian Jornet youtube clips and the biggest thing I’d noticed is that Kilian makes running fast on technical ground look easy. 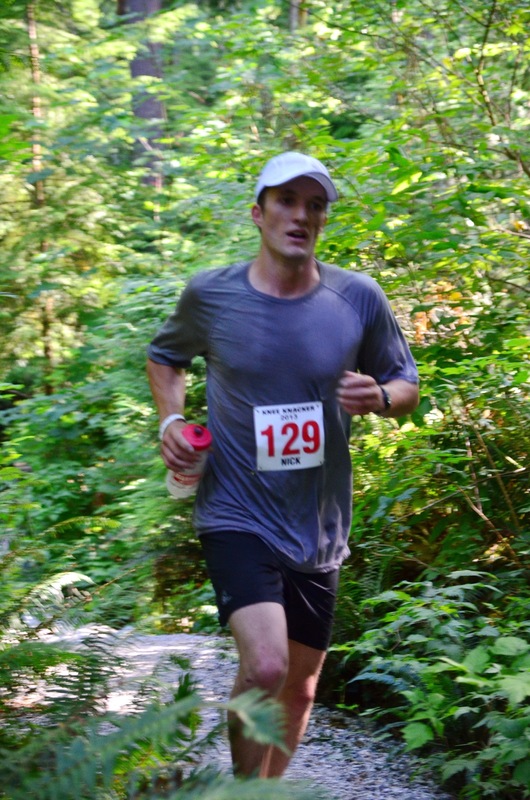 Trail running is deceptively technique-intensive and I’d been practicing trying to run like Kilian. By the time I arrived at Mountain Highway, I still felt strong, but I don’t think anyone would have said I was making it look easy. There’s a long set of stairs that descends into Lynn Valley and when I arrived at the top my first thought was that I ought to bum-slide down the railing. I quickly decided that it was not worth the slivers, but in retrospect, I think my legs may have been trying to tell me something. As I ran along the Varley trail in Lynn Valley I was looking forward to the upcoming aid station but still feeling as though I was running at a sustainable pace. The trail ends with a short climb, and it was here that seemingly out of nowhere my right leg seized up. 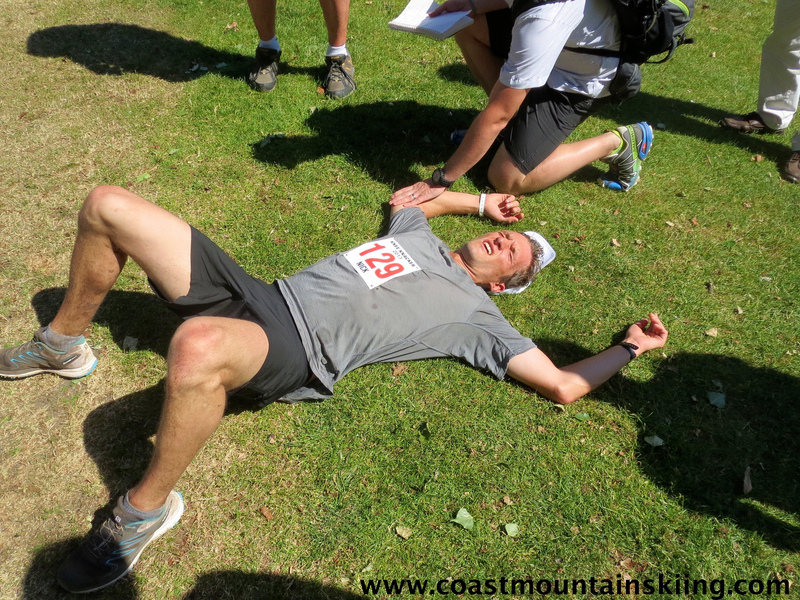 I’d never experienced cramps before in races or training so it came as quite a shock. I swore and laughed (it’s the kind of pain that makes you laugh involuntarily) and stood there stretching for 30 seconds until it subsided. I then jogged across the bridge to where my aunt was waiting with her hands full of supplies. I choked down an electrolyte pill and tried to eat some potato chips without much success. I also had to swallow my pride as I walked up the gentle hill past the crowd of volunteers and spectators that were cheering me on. Walking up to the Rice Lake aid station. I was frustrated and feeling a bit sorry for myself. I had energy to spare but my legs had other ideas. Thankfully, beyond the aid station there was a relatively gentle section of trail where I was able to ease back into running. I discovered that as long as I stayed relaxed, I could run on the downhill and flat. Unfortunately, when I tried to push the pace or lift my foot more than an inch off the ground, I’d seize up immediately. While on the short but steep climb that leads up to Lillooet Road, I had some doubts about whether I’d make the top of the hill, let alone the finish line. As I passed the Hyannis Road aid station I took some encouragement from the fact that no one had caught me yet. However, I hadn’t made it far down the trail before I could hear cheering coming from behind me. I was barely shuffling up a moderate incline when I saw Adam. I told him that my legs were cramping and he reassured me that that was how I was supposed to be feeling at this point in the race. Then, in a shamefully unsportsmanlike moment, I may have pleaded with him to take out Gary for me (sorry Gary!) since by that point I figured that a Tonya Hardingesque attack with a tree branch was pretty much my only hope of maintaining the lead. Sure enough, as I made my way up the steepest part of the climb I caught a glimpse of Gary behind me and by the time we’d reached the top, he’d hiked his way past me and out of sight (welcome to ultra running). As the course dropped down the Mushroom Trail towards Seymour Road I tried to open it up and run a bit faster, only to find that my legs were now threatening to cramp on the downhills as well. It was at this time that I heard someone behind me and before I knew it, Mike Murphy came sprinting past. In fact, he was running so quickly that he slid out on the next corner and went down hard. He was immediately back on his feet and powering past me a second time and there was still nothing I could do. When I popped out onto the Indian River Road, I could see that Mike was quickly closing the gap on Gary. When Gary passed me, I’d asked him if there was anyone close behind and he’d replied that he didn’t think so. When I saw the way that Mike was running, I felt almost certain that he’d catch Gary by surprise and go on to win. As it turned out, Gary was able to draw on his years of experience and mental toughness to find another gear when he needed it most. 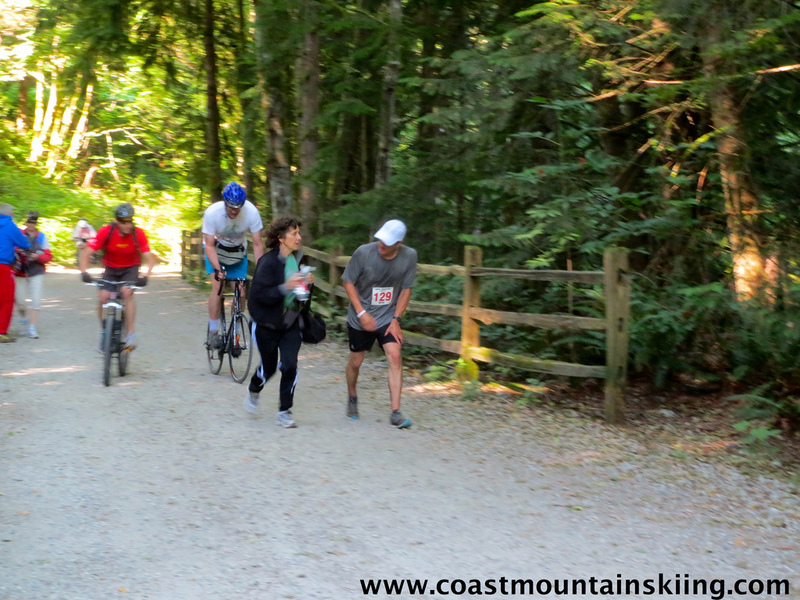 I left the road and began the final descent to Deep Cove 40 seconds behind Gary and Mike. My only hope was that both guys might somehow be slowed by an errant dog or a large group of hikers (this is actually a real possibility on this section). I pushed hard towards the finish, only to come to a grinding halt on the first small climb. Both my legs had seized and I was getting some strange looks from the group of hikers that I had just scattered as I charged past. I resigned myself to just trying to make the finish line and, although the trail seemed interminable and the hordes of hikers impenetrable, eventually I did. After I finished, I lay down (collapsed) on the grass for a while and was fortunate to have so many wonderful people around to attend to my needs. During the race, I had been mildly devastated to be leading and then to be passed so close to the finish. But once I finished and had a chance to reflect, I realized that there were plenty of reasons to be happy about how I’d run in my first ultra. In fact, it was a privilege and a great learning experience to compete against such a strong field. Gary and Mike were faster and smarter than I was and I think I learned a thing or two from both of them that will help me in the future. • I finished in 4:44:07 which was the 5th fastest time in the history of the race. Gary’s time of 4:41:28 was the second fastest ever (behind Aaron Heidt’s 4:39:52) and Mike’s 4:42:32 was 5 seconds faster than Kevin Titus’s previous masters record. Conditions were obviously conducive to fast times but I’m still quite ecstatic with how quickly I ran. 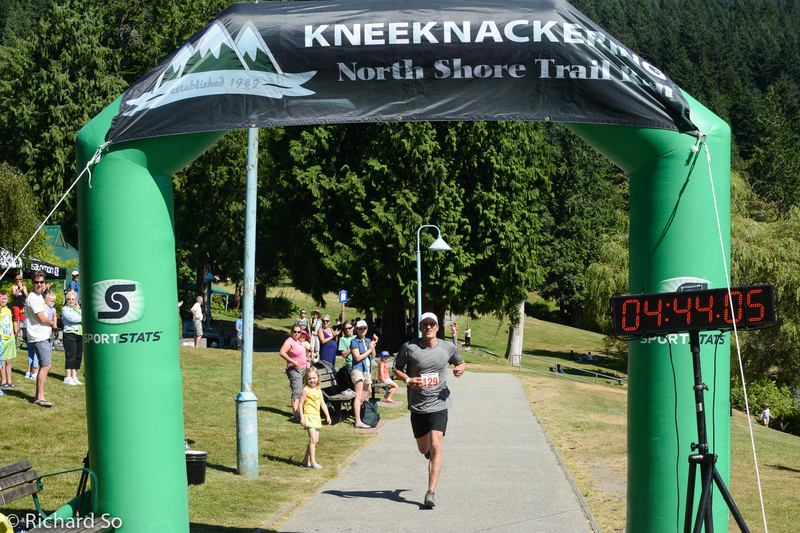 • The Kneeknacker is a wonderful race. It’s a community event put on exclusively by volunteers with all the proceeds going to charity. 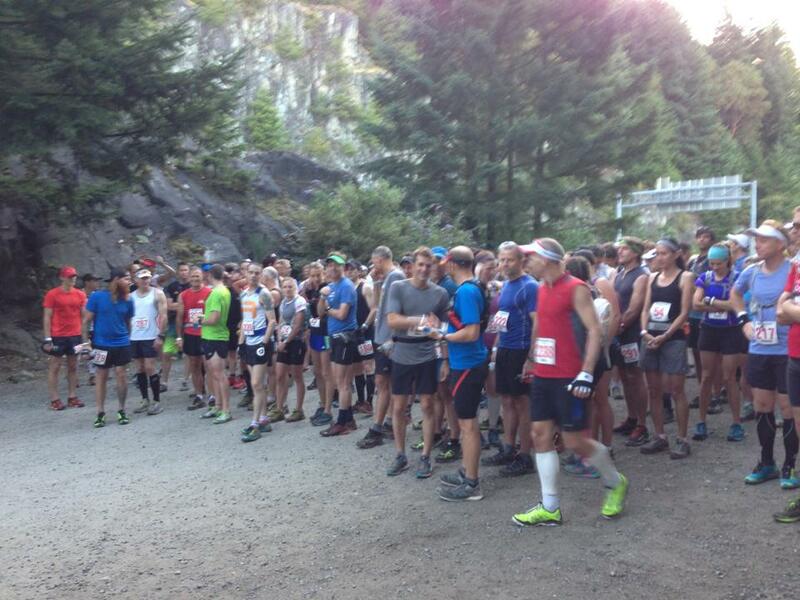 Just about everything is top-notch from the aid stations to the banquet to the race t-shirts. 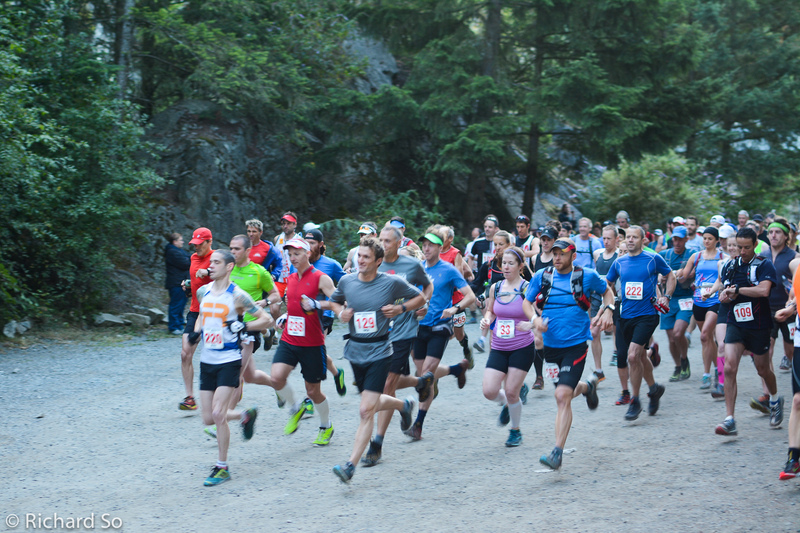 It’s got a long and storied history (for a trail race) and attracts a strong local field. This may be sacrilege to North Shore locals, but I don’t really think that the Baden-Powell is a particularly great trail. It travels predominantly through dense forest with plenty of sections that are an eroded mess due to heavy rain and heavy use. Nonetheless, it somehow makes for a great race with distinct sections and plenty of character. • A thank you to everyone who cheered for me, fed me or sent me photos. Thanks to Scott W. for the shoes and shorts, Tim B. and his mom for the potluck, and Sue, Eric and Karina for the support on the course. • I hope I get into the lottery next year! That was awesome seeing you push through seized legs on the final climb before the finish. Inspiring dude. Nice race and nice post Nick! Great post Nick! And really fantastic work on your first ever ultra & Knacker! ha ha- you did indeed write an essay!!! nice work dude.